NOTE: Manheim Dealer 2 Dealer is available to licensed automotive dealers who have an existing subscription to Manheim Dealer 2 Dealer service. • Members-only access to exclusive Event Sales - bid on fresh trades, CPO, and frontline ready inventory BEFORE it goes to auction. 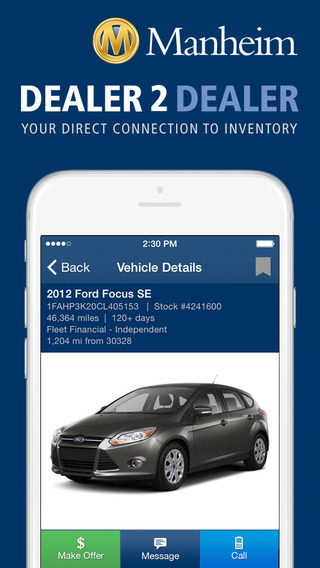 • Search for inventory, get instant alerts on new listings, and make offers on vehicles you need, anywhere, anytime. • Instant Alerts put the cars you need in front of you as soon as they are posted to Manheim Dealer 2 Dealer. Make an offer and receive responses directly from selling dealers. • Scan, appraise, and share off-make trade-ins, aged inventory, and hot lane purchases with one of the industry's fastest VIN scanners. 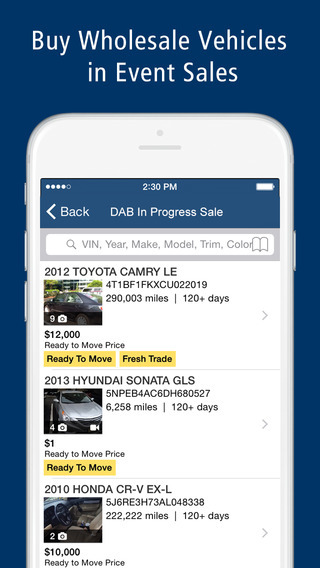 Add photos, walk around videos, and seller's disclosures to your inventory, and share vehicles with your trading network, other Manheim Dealer 2 Dealer members, and your retail customers. • Get vehicle history and book values including AutoCheck, Manheim Market Report, Manheim auction transactions, and access your past appraisals with just a few clicks. - Save time and make offers on the go with instant Vehicle Alerts. You'll now receive notifications on your phone when inventory is marked Ready To Move and matches your saved searches. - Multi-rooftop dealerships can now mark any of their vehicles ready to move, sold, inactive and you can add video and photos to any vehicle at any of your dealerships. Fixed crashing around VIN scanning and other iOS7 issues. * Offline VIN Scan – No internet connection, No problem! 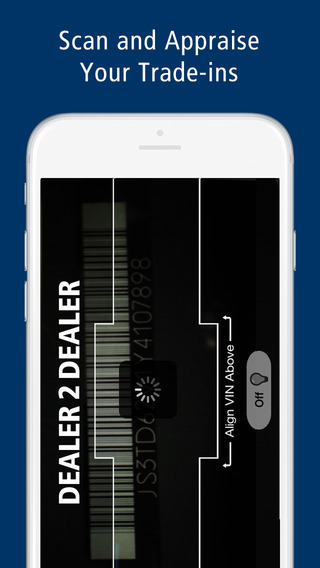 Offline VIN scanning allows you to capture VINs offline and finish appraising when your connection is restored. Address application crash when scanning a VIN. · Keyword Search – Search from thousands of DealerMatch Members' inventory by Year, Make, Model, Trim and Color. · Average Retail Price – Quickly compare the average retail price of the vehicle you are appraising in the seller’s market, your market, and nationally. · View Dealership on Map - See how far a vehicle is away from your dealership. · Performance and UI improvements. 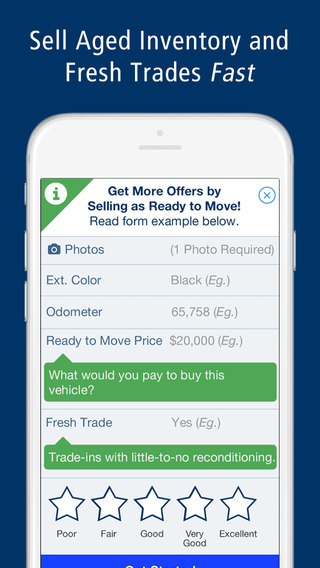 DealerMatch just got better, in a big way. Install this update to get access to the features you've been asking for! DealerMatch is a community built by and for its members. We're always listening! Send us an email or call us with any suggestions and feedback. · Multi-photo support - Share and stock vehicles with up to 27 photos. I'm glad there is finally an app that has a VIN scanner, valuation tool, and an email feature to send out the details to my buyers before I spend any time working the car. Worth the membership! It's about time that a company helped to bring transparency to the used car market! This app will especially really help right after I get a trade in.